Do you feel hungry all the time when you are dieting? Maybe feeling denied that you have to avoid the tasty foods? 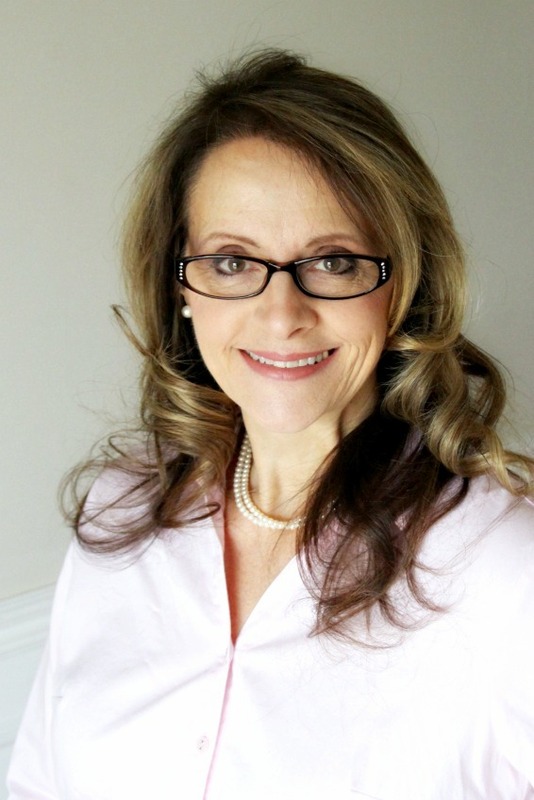 Those nasty little calories can add up fast leaving you with a nagging tug in your stomach and an urge to reach for something you know will cause guilt. Maybe you are just trying to eat healthier and feed your family cleaner food with less additives on the label. My husband participated in a weight loss challenge this past winter. The goal was to lose 7-percent of your body weight in three months. He did really well, lost 17 pounds and met his goal. He looks better and feels better. After his hard work he certainly doesn’t want to regain a pound. He learned portion control and what foods he can eat in quantity and what foods are reserved for treats. He also gained an appreciation for foods he would had passed on and now enjoys. This really isn’t a recipe. 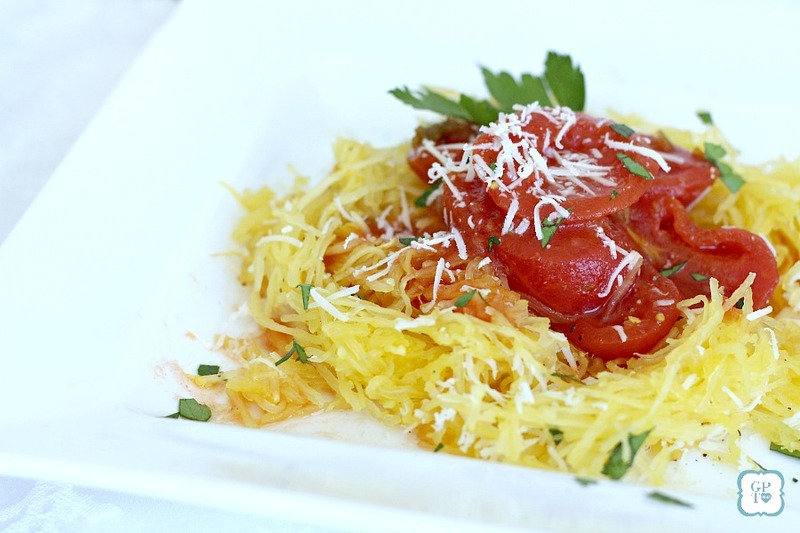 Just a how-to for baking the spaghetti squash. 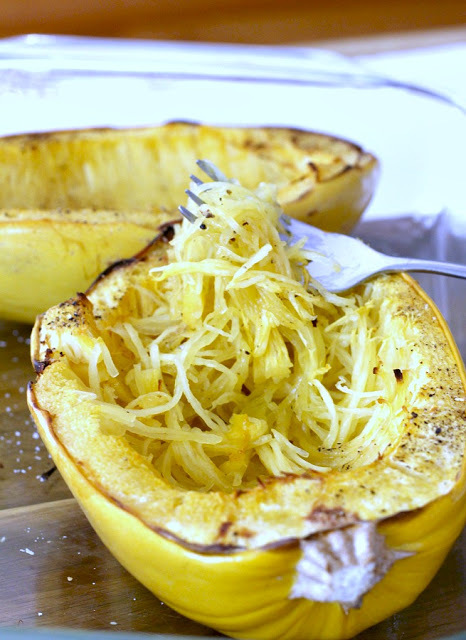 The hardest part about this meal is cutting the squash. These babies can be difficult so use caution to protect your fingers. 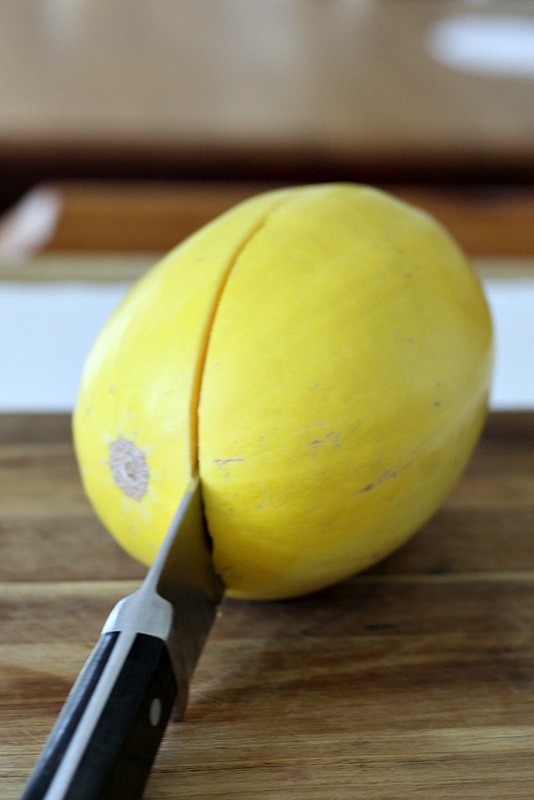 Carefully pierce the squash and cut through. You may have to work through both ends. 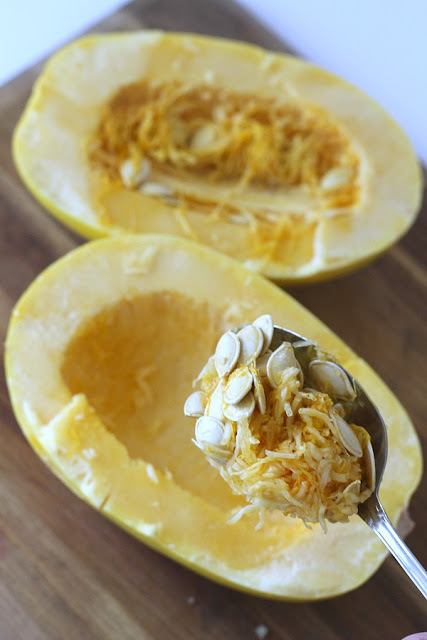 The inside is full of seeds and pulp that needs to be removed. 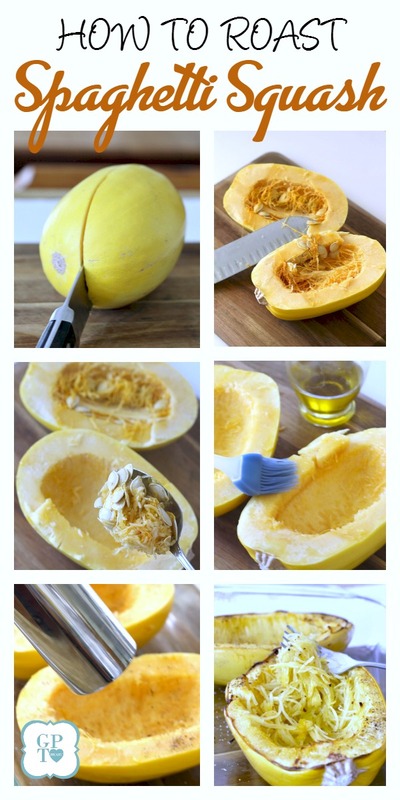 Using a spoon, scrape out the seeds and stringy fibers. 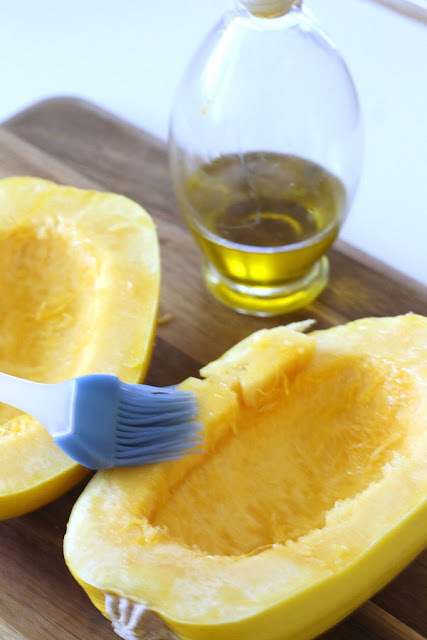 Lightly brush on olive oil. 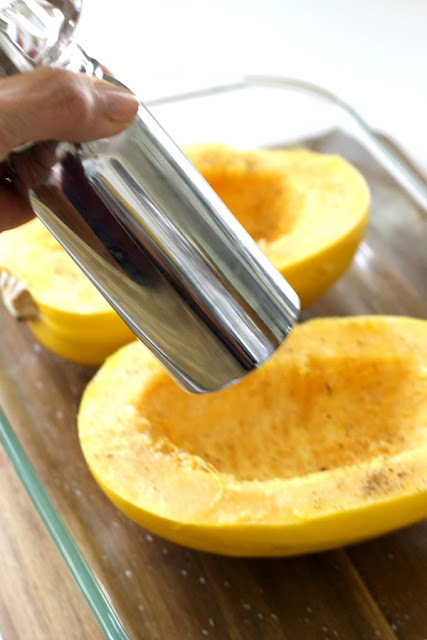 Sprinkle with a little salt and pepper and bake in a 375 degree oven for 45-60 minutes or until tender. 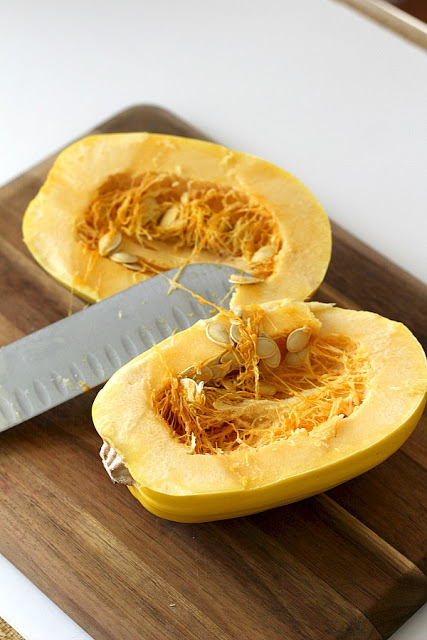 Many recipes say to place the squash cut-side down into the dish. I place it cut-side up because I like the tinge of brown along the tops. You can bake it either way. I like to add a can of stewed tomatoes onto the squash and then shave some Parmesan cheese and parsley on the top. 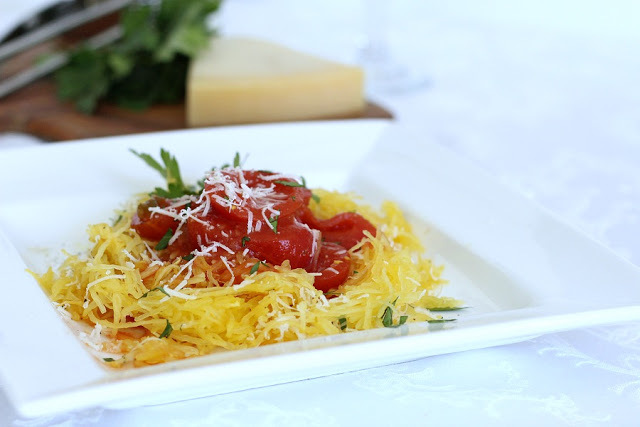 You can pour on pasta sauce or marinara sauce and any cheese you like. Slices of cooked chicken will make it even heartier. 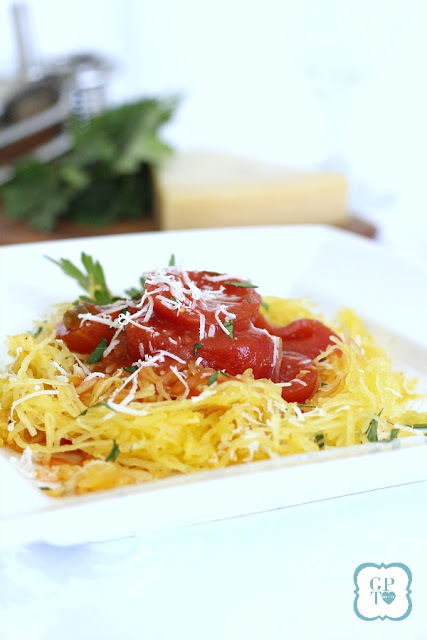 There are only 40 calories per cup of baked spaghetti squash. That is amazing to me. 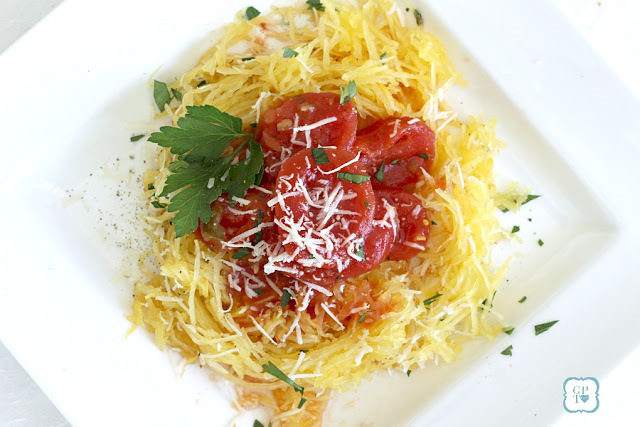 We grow spaghetti squash in our garden. 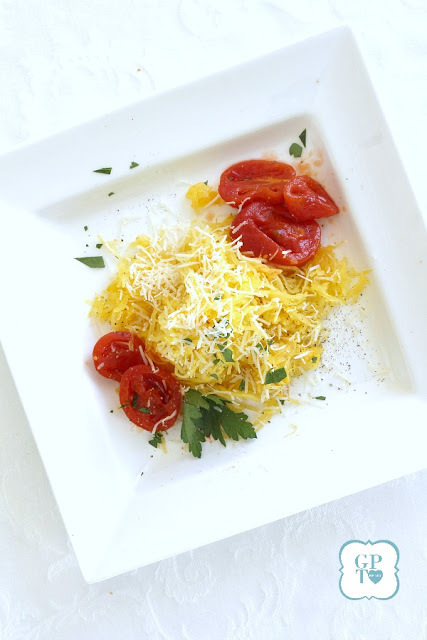 Our favorite dish is a greek dish from allrecipes. 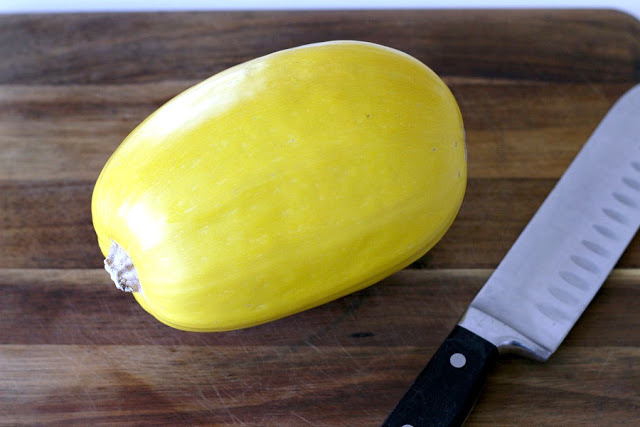 I've even made breakfast fritattas with this squash. Yum.